Music on Main’s MODULUS FESTIVAL: The Roundhouse, Post at 750 and CBC Studio 700, November 2-6, 2018. Following on the momentum gained from hosting the ISCM World Music Days in 2017, David Pay and Music on Main continue their 5-day Modulus Festival this year, featuring a rich diversity of artists and offering an excellent sampling of what is current in the world of new music. It usefully complements Vancouver New Music’s ‘Quartetti’ extravaganza of two weeks earlier (24 contemporary string quartet compositions played by seven ensembles) in bringing a heightened new music inspiration to Vancouver’s fall season. Fluidity of form and genres defined the Modulus Festival’s musical offerings, and attention was drawn to musicians who are both composers and performers. Opportunities for mingling between performers and the audience was also an important aspect of the festival. Among the many notable events, Music on Main’s Composer-in-Residence, Nicole Lizée, teamed up with British composer/vocalist Laura Bowler to present a concert of chillingly insightful music, singer and medieval scholar Katarina Livljanić performed Kokla Kokabula, while Eve Egoyan presented dramatically-staged pieces for piano and electronics. Two of the most inspired concerts were by young British pianist Richard Uttley, and the Standing Wave Ensemble contributed their inimitable expertise at the end. Lizée and Bowler employed the now-standard contemporary chamber combination of three wind players (each doubling on the colour instruments of their section), three string players, electronics with live feed and video screen/turntables, with or without percussion. Bowler’s FFF (2017) features herself as soloist in a literal tour-de-force. Unabashedly programmatic, it focuses on the world of social media, where pathologies such as psychosis and the sociopathic manipulation of images of self and others are pervasive. However, such pathologies are taken not as a subject of direct concern but more as a wonderful mine source of artistic technique – producing a genuine howl of immediacy. FFF combines video and electro-acoustic samples of Bowler’s social media experience with newly composed orchestral elements and those of live vocal performance. Following the perspective of Theodor Adorno’s Negative Dialectics, the core of this fascinating work is the question of whether an escape from the ring of constant self-reflection can be accomplished by those whose own self has been created in an online environment. Bowler’s work bears a generic link to Lizée’s well-known advocacy of ‘glitch music’: for example, overlaying music and visuals on Hollywood cult film scenes that are distorted and recast by malfunctioning media technology. Lizée’s Malfuctionlieder (2017) was performed by Bowler (who is indeed an accomplished singer) and fits squarely into this genre of the aesthetics of failure. The collaboration produced breathtaking results. 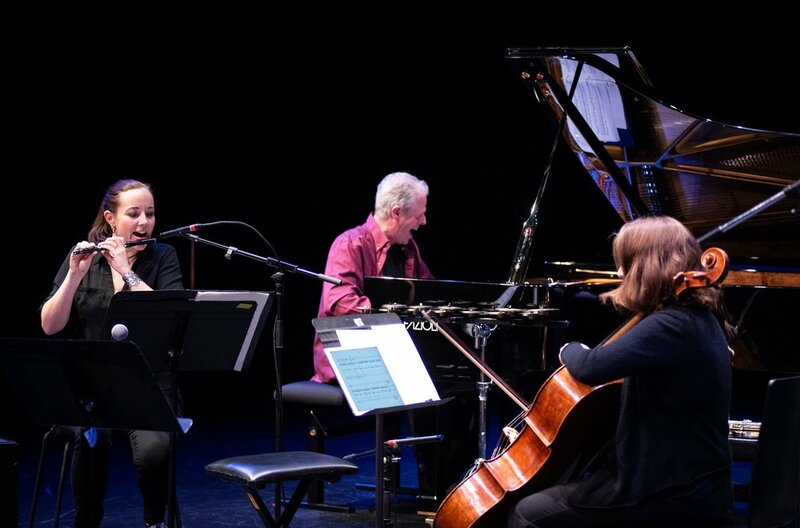 The opening concert of the festival (generously supported by the Consulate General of France in Vancouver) featured the supremely talented composer/singer Katarina Livljanić, who we have previously seen here with the Dialogos Ensemble (review) and who is also a member of Sequentia. 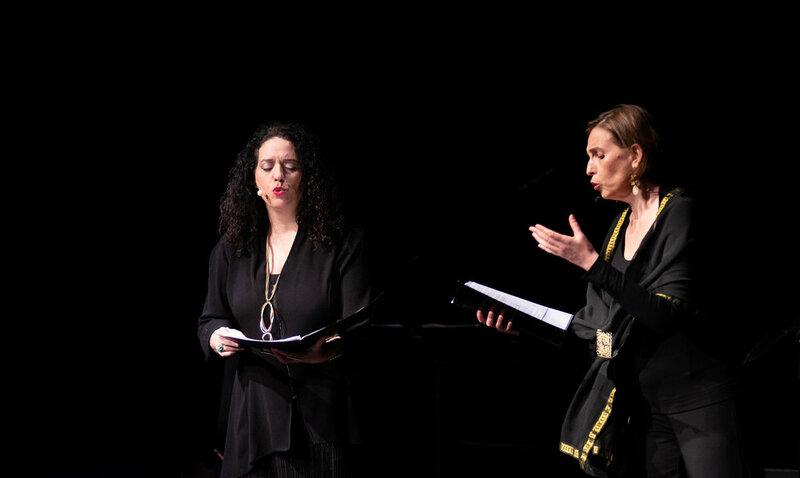 With her estimable Ensembles Variances, she performed her Kokla Kokabula, a poetic dissertation on the patriarchal locus of control in European religious culture. This is set in vernacular medieval chant and explored the tension between Christian Byzantium and her colonies (in this case, Croatia). Indeed, Livljanić’s insights might easily apply to the fragmentation of the Western Empire in general. The performance was beautifully polished and fully sublime, and Ensemble Variances positively glittered. Of the three venues used for the festival, the smaller and more intimate settings of Studio 700 at CBC Vancouver and the Post at 750 produced some of the most inspired concerts of the festival, in particular the performances by pianist Richard Uttley, who has been in the UK spotlight since 2010. His first programme ranged from Eric Wubbels post-tonal Psychomechanochronometer (2013/15) to Naomi Pinnock’s incredibly fun exploration of the overtone series, Lines and Spaces (2015), and culminated in the excruciatingly refreshing, microtonal Ein Schattenspiel (2004) by Austrian Georg Frederich Haas. What I loved about this programme is how much of the emotional payload of this music comes from its temporality and patterned structure as opposed to its harmonic resolution. Uttley’s touch is perfect for such minimalism: he is sensitive and clearly given to introspection, and there is a cleanness and modesty to his articulation. Uttley’s second concert was an intimate and frolicsome affair presented interestingly enough in the Music on Main office canteen. It was most notable as an introduction to the music of Mark Simpson, whose Barkham Fantasy (2009-10) came off as a revelation, a sure cure for the ennui that ails you! Canadian pianist/ composer Eve Egoyan’s programme was entitled ’Solo for Duet’ and consisted of dramatically-staged pieces for piano and electronics based on the fluid form interchangeability of monads and dyads – to capture the intrinsic unity in duality. More specifically, Egoyan’s interest was in musically representing two female aspects that become one, as can be referenced in pairings from antiquity to the present such Inanna/Ereshkigal, Aphrodite/Persephone, Madonna/Brittany, and of course the ubiquitous Christian conjunction of Mother Mary/Mary Magdalene. Unfortunately, despite excellent staging and Egoyan’s prodigious facility with the piano, this program failed to hit its mark fully, due to the inability of Egoyan to fully distinguish and contrast the two sides of her unity in a recognizable way. Otherwise, the piano playing was flawless, and the programme was really incredibly ambitious. I would look forward to seeing the next incarnation of this project. The Modulus Festival consists of more than sit-down traditional concert events; there were ample opportunities to engage with the artists and performers. Graham Mackenzie, Artistic Director of the Huddersfield Contemporary Music Festival, who attended in his capacity as the co-presenter of the concerts by Richard Uttley as well as the performance of Laura Bowler, gave the first of two free artist talks, hosted at the Music on Main studio offices and the Post at 750. There were free immersive child friendly concerts at the Roundhouse, and a co-presentation with DOXA of a film on the work of American jazz drummer Milford Graves. 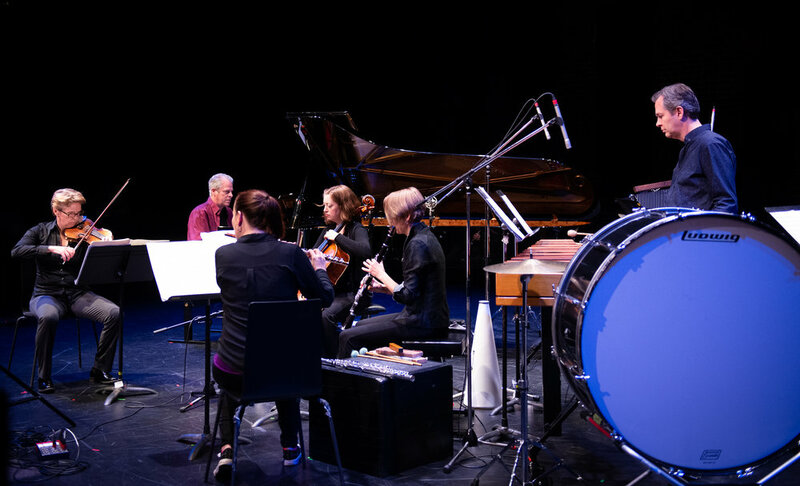 The final concert of the festival, entitled ‘Mythos’, featured the sovereign Vancouver-based new music ensemble Standing Wave, and was warm and light-hearted in many ways, while still seeking new boundaries. Featuring premieres by Canadian composers Jocelyn Morlock, Keith Hamel, and Anna Höstman, Mythos was perhaps a front row seat for what’s next in contemporary music. Morlock’s latest work Stone’s Throw shows her compositional command of musical rhetoric increasing and evolving in a most powerful way. This performance was an experience of coming away healed of strain. Hamel shared with us that he is a total Beatles nerd; his Just Another Day is both commentary on, as well as a pastiche of, the work of the Fab Four, which fittingly is Hamel’s contribution to Standing Wave’s fascinating 20C Remix Project. This project invites a composer to remix a 20th century work for their ensemble forces. In contrast, Höstman took her cue from antiquity: the Medusa slaying in Ovid’s Metamorphoses. The delicate and watery imagery of Coral was the realization, where sea nymphs venture near the dismembered head of the monster in promise of coral ornaments for their hair. This year’s Modulus Festival continued to offer engaging musical variety for both aficionados and newcomers to contemporary classical music, while enlisting absolutely first-rate artists. It remains one of the city’s best opportunities to stay (or get) informed on the latest musical trends, both at home and away. For those who might think of new music as glamorous and upbeat, the proceedings might have seemed a little less brightly lit than expected. But perhaps the better for it: after all, musical discovery comes in many forms, is often a more austere and introverted process, and arises from the contemplation of deeper possibilities. One can only marvel at the creative force exhibited by each composer/performer.